Dull day? Give it a touch of shine. Say farewell lacklustre complexion and hello to a naturally beautiful complexion! 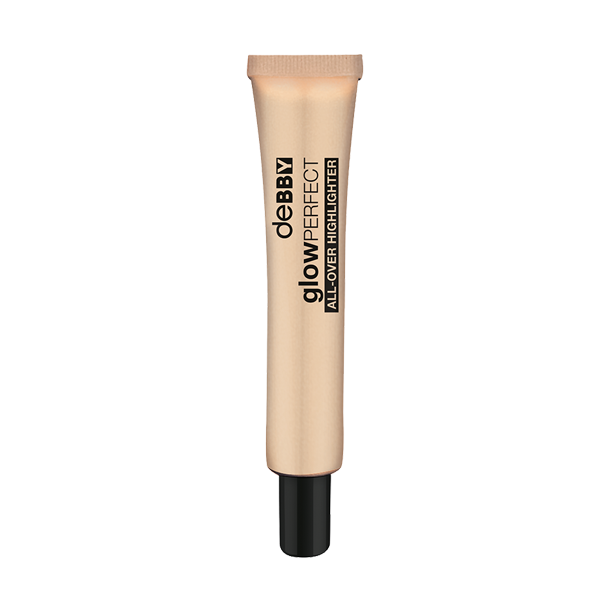 deBBY’s highlighter uses strobing to give the face and skin dewy, shimmery highlights. The soft, fluid texture is formulated for effortless application. Ingredients include ultra fine light-reflecting particles that impart a gorgeous glow with a subtle metallic finish. IL140618A INGREDIENTS: AQUA, GLYCERIN, ISOSTEARYL ISOSTEARATE, DICAPRYLYL CARBONATE, SYNTHETIC FLUORPHLOGOPITE, SODIUM POLYACRYLATE, BIOSACCHARIDE GUM-4, ETHYLHEXYL HYDROXYSTEARATE, LEUCONOSTOC/RADISH ROOT FERMENT FILTRATE, POLYQUATERNIUM-51, SODIUM HYALURONATE, SODIUM PCA, TETRASODIUM EDTA, TREHALOSE, CAPRYLYL GLYCOL, MICA, UNDECYLENIC ACID, UREA, PHENOXYETHANOL, PARFUM, ALPHA-ISOMETHYL IONONE, HEXYL CINNAMAL, HYDROXYCITRONELLAL, LIMONENE +/- CI 77163, CI 77491, CI 77891.